Arizona at Houston, 12:00pm on ABC/ESPN2: DT Ed Oliver started the season strong with 13 tackles against Rice in Week 1. Unless he completely implodes this season he’ll remain atop most positional rankings for the 2019 NFL Draft. It will be interesting to see him chasing Arizona QB Khalil Tate. Tate rushed for a short yardage score against BYU in the opener but otherwise had just 7 attempts for 12 yards. UCLA at #6 Oklahoma, 1:00pm on FOX: New UCLA coach Chip Kelly got off to a rough start with a loss last week against Cincinnati and it doesn’t look like he’ll be able to rebound in Norman. OU got off to a solid start on offense with QB Kyler Murray tossing 2 TDs and 209 yards on just 11 attempts. Similarly, RB Rodney Anderson dominated, rushing for 100 yards and 2 TDs on just five carries. It’s premature to say definitively, but Anderson is growing on me and will contend for my RB1 spot come the Spring. #3 Georgia at #24 South Carolina, 3:30pm on CBS: This game is one of the reasons I picked South Carolina as a team to watch in the SEC. It’s rare to play your biggest divisional game so early in the season before teams are in their groove. The fact that the Gamecocks get the game at home is even more encouraging. Both teams dominated FCS foes last week so we didn’t really learn anything. I’m still picking Georgia to get the road victory but this game is a must-watch for the chance that it totally upends the CFP. 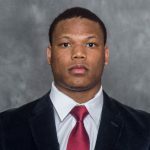 Iowa State at Iowa, 5:00pm on FOX: Iowa State’s opener was cancelled so this will be our first chance to see RB David Montgomery, one of my favorites from last season. 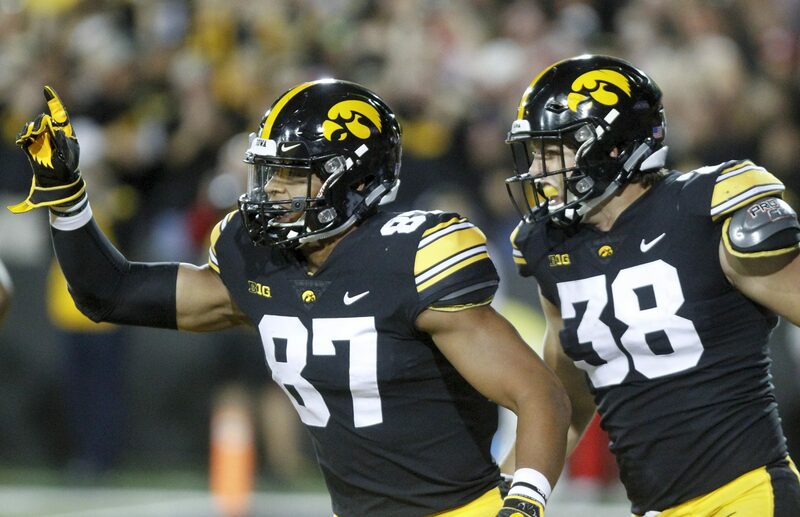 The fact that this one also includes Iowa draft hopefuls QB Nate Stanley and TE Noah Fant make it a good midday watch if the 3:30pm games are blowouts. Kentucky at #25 Florida, 7:30pm on SEC Network: Kentucky hasn’t beaten Florida since 1986 but this may be the year. I am not a Florida fan and I will likely find myself picking against them all year. This one is easy for me to pick against the Gators though because I’m becoming a Benny Snell fan. He started the season well with 125 yards and 2 TDs on 20 carries against Central Michigan to start the season. He’s likely to be a 2019 fantasy asset so you might as well start paying attention now. #17 USC at #12 Stanford, 8:30pm on FOX: I literally put my money where my mouth is when it comes to USC this season. Now that sports betting is legal in New Jersey, I placed a few season long futures and one of which was the over on 8.5 wins for the Trojans. USC let UNLV hang around last week but they ended up winning convincingly in the 4th quarter. USC’s true freshmen stole the show in that contest. QB JT Daniels threw for 282 yards and a TD while WR Amon-Ra St. Brown caught 7 balls for 98 yards and a score. Their 4th quarter touchdown connection was a beauty and is hopefully a sign of things to come. When Stanford has the ball, the two who should have your attention are RB Bryce Love and WR JJ Arcega-Whiteside. Love disappointed with just 29 yards on 18 carries so he’ll need a big bounce back game to stay in Heisman consideration; I’ll cover Arcega-Whiteside more below. USC may be too inexperienced for this early-season conference matchup but it’ll be a fun one to watch regardless. Daniel Jones, QB, Duke: Jones started well against Army last week. He completed 13 of 17 passes for 197 yards and a TD while adding 43 yards and a touch on the ground. I still believe Jones has the raw tools to be the top quarterback in this class but he has to prove that he can play with the same efficiency for an entire season. Tua Tagovailoa, QB, Alabama: Tua isn’t draft eligible so don’t get too excited yet but my god did he look explosive against Louisville. I don’t know if he has the mechanics of the position down yet but there’s an ease and fluidity to his movement that you don’t see in other players. It’s like he’s playing at a higher frame rate than the other 21 guys on the field. Patrick Laird, RB, Cal: Laird had an impressive 33 touches against UNC in the opener, gaining 109 total yards and 2 TDs. Laird posseses good size (6000/205) and pass catching ability (45 receptions last season; switched from receiver). Laird is a former walk-on who impressed me in interviews at PAC-12 Media Day while talking about his children’s summer reading campaign. He may not be a top prospect but I’ll bet his combination of size, hands and character lands him on an NFL roster. TJ Vasher, WR, Texas Tech: Vasher made the highlight catch of the weekend with a ridiculous Odell-esque one-hander. He is a lean redshirt sophomore who is listed at 6060/190. He should blow away last year’s 29-545-6 line by midseason on the high powered Texas Tech offense. His ball tracking appears to be good to elite. His hands are good and he often hand-catches the ball rather than letting it get into his body. In the limited sample I watched he also showed good sideline awareness to make plays near the boundary. Below is an example of him using all three skills on a single play. The defender’s hand flashes in front of his eyes just as he’s about to catch the ball but he manages to still make the grab while spotting the landing. Arcega-Whiteside isn’t a burner but does have enough speed to create separation on downfield routes. Because of his jump-ball play style, he does not often find himself in RAC situations (save for a long score against SDSU when the defender fell down). DraftScout.com predicts his speed to be 4.59 but I think he looked a shade quicker. I need to see more to give him an accurate comparison but as far as size and speed go, you can equate him to somebody like Allen Robinson. I saw comps on Twitter to Mike Evans which I can see when it comes to him winning in the air but Evans is at another level physically. My viewing did not expose me to much of Arcega-Whiteside as a blocker or as a route runner. I’ll need more time, and more film, to give him a proper grade in these areas. 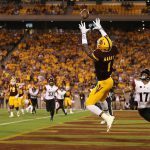 J-JAW’s fantastic first game put him squarely on my radar for the 2019 NFL Draft. We should monitor him closely over the next few games, especially this week against a superior USC defense. If he continues to produce he’ll deserve a deep dive in the offseason. Heisman Favorite: Will Grier, QB, West Virginia. It feels like cheating when I take the best passer in the conference as my Heisman favorite. Alas, that’s the way it goes these days. Grier threw for 3,490 yards in 2017 but he’ll need to approach 4,000 if he’s to be a true Heisman contender. Darkhorse Heisman Candidate: Kyler Murray, QB, Oklahoma. Murray has name cachet already because of his impending baseball career. He was selected 9th overall by the Oakland A’s but still plans to play football in 2018. If Murray is playing well, which I anticipate, he will get a lot of buzz because he has a story media outlets can sell. 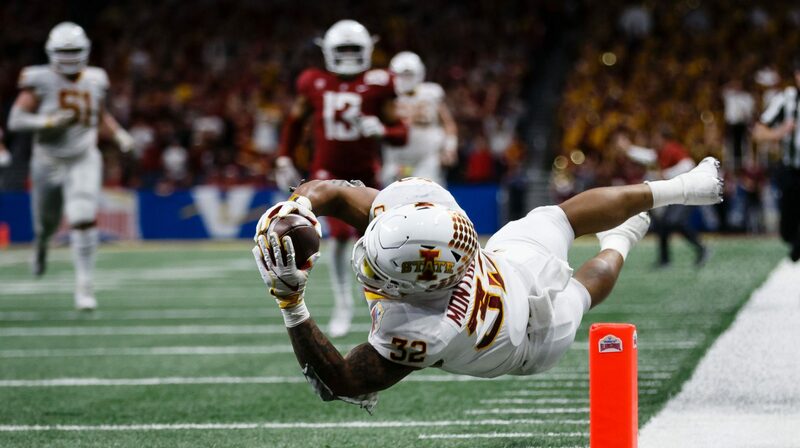 Offensive Player of the Year: David Montgomery, RB, Iowa State. No offensive player will mean more to his team this season in the Big 12 than Montgomery will to the Cyclones. He is not a breakaway runner but he has amazing balance and tackle breaking ability. He’ll have a number of “how did he do that” highlights again this season. Defensive Player of the Year: Joe Dineen, LB, Kansas. Dineen was a Second-Team All-American last season after a 133 tackle season. He led the Big 12 in tackles and tackles for loss in 2017 (and was top five in the nation in both stats). He also added 2.5 sacks. He may not draw the NFL Draft hype that Texas Tech LB Dakota Allen will but Dineen will again prove to be a bright spot on a poor Kansas team. Newcomer of the Year: Keaontay Ingram, RB, Texas. Ingram was ranked the #6 running back in the class by 247Sports and #10 by Phil Steele. Ingram is listed at 6010/190 which is good size for an incoming freshman. He hails from Texas and received an offer from just about every school in the Big 12 and Big Ten so it was a good get for the rebounding Longhorns. Per 247Sports, Ingram had 39 total TDs and over 2,500 total yards last season. Texas’ leading rusher last season, with 385 yards, was QB Sam Ehlinger so the depth chart is wide open for Ingram to earn a role. Underclassman to Watch: Ceedee Lamb, WR, Oklahoma. Lamb was the Sooners third leading receiver last year (46-807-7) as a true freshman. While the numbers weren’t stellar, Lamb stood out to me a few times when I watched OU play, specifically against Texas Tech. He took over that Tech game, earning 147 yards and 2 TDs on 9 receptions. He was a bit inconsistent in 2017 but I would expect that to even out as he gains more experience. He’ll need to adjust to a new quarterback again this season but I’m expecting a 60-1,000-8 season from Lamb which would put him in the NFL Draft conversation for 2020. Best QB-WR Tandem: Will Grier and David Sills, West Virginia. I wanted to avoid listing West Virginia or Oklahoma here to add a little variety to the preview but there just aren’t enough good quarterbacks right now in the Big 12. Grier and Sills are the name brand tandem to watch. Grier also has WR Gary Jennings to target. Last year Jennings led the team in yards and receptions but isn’t the scoring threat that Sills is while playing over the middle from the slot. A sleeper QB-WR tandem to keep an eye on is Iowa State’s sixth year senior QB Kyle Kempt and WR Hakeem Butler. Kempt battled injuries but was efficient when he played (145.9 rating, 15 TD to just 3 INT); Butler has great size at 6060 and averaged 17.0 yards per catch. Best RB Corps: Oklahoma. The Sooners have one of the best backs in the conference in junior Rodney Anderson (more on him below) but it’s more about the supporting cast. Lincoln Riley’s backfield also boasts sophomore Trey Sermon who had a great true freshman season (744-5 rushing and 16-139-2 receiving) and is a devy league darling. New to the mix this season will be redshirt sophomore Kennedy Brooks and freshman TJ Pledger. Both Brooks and Pledger were 4-star recruits according to 247Sports. OU’s third-stringer was good for over 500 yards last year so I expect both to contribute. Defenses will also need to be wary of QB Kyler Murray who has wheels; he rushed for 142 yards on just 10 carries last season in limited duty. Coach on the Hottest Seat: David Beaty, Kansas. It should be no surprise to find Beaty in this ignominious position after a 1-11 season in 2017. In his three seasons with the Jayhawks, Beaty has just 3 wins (and 33 losses). Kansas won’t be good this season but they will be improved. I’m thinking that four wins saves Beaty his job and that might not be a stretch given the experience this squad has. As I mentioned above, Kansas is very experienced. So much so that Phil Steele ranks them as #1 in his NCAA Experience Chart for 2018. The Experience Chart is a favorite tool of mine to aid in finding under-the-radar teams for the upcoming season. While the Jayhawks may not posses much talent, their consistency and maturity will help. The team returns 19 starters but even more importantly is the depth that they return: they have the second most letter winners returning in the nation. The two returning quarterbacks, Carter Stanley and Peyton Bender, split time last year due to ineffectiveness and injury. Leading rusher Khalil Herbert (663-4) is back, as is WR Steven Sims (59-839-6) who also doubles as a return man. The aforementioned LB Joe Dineen leads the defense. Kansas should start with two wins against Nicholls and Central Michigan. It’s feasible they split the next two games, home against Rutgers and at Baylor. That could be the extent of their wins for the season but because of their experience I would not count out the possibility of getting to four and saving David Beaty’s job. I’ll be watching Oklahoma State closely this season, but not because I expect them to improve upon last season. Instead, I’m half-expecting Mike Gundy’s team to implode in 2018. The Cowboys lose QB Mason Rudolph, WRs James Washington and Marcell Atemen and three of their four top tacklers. In contrast to Kansas, OK State is one of the least experienced teams in the nation (ranked #119). They do return RBs Justice Hill and JD King but the offense may struggle for the first time in years. Senior QB Taylor Cornelius is the presumed starter but graduate transfer Dru Brown could beat him out. 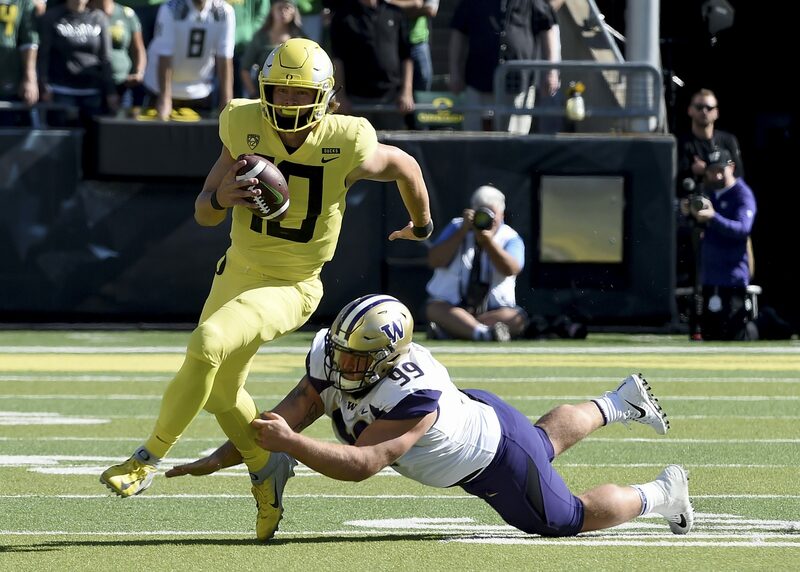 Whoever is under center will be hoping that WRs Jalen McCleskey and Dillon Stoner can pick up the slack after the departures of Washington and Ateman. If you’re a bettor, Oklahoma State will be an interesting team to handicap. The schedule starts favorable with four straight home games (Missouri State, South Alabama, Boise State, Texas Tech) and then features two winnable road games before their bye week (Kansas and Kansas State). I would pick them to win most of those games, but chances are you can safely take the points against Boise State, Texas Tech and Kansas State. It’s possible that the Cowboys are 6-1 and riding high heading into their October 27th matchup against Texas, but I think it will be fool’s gold so don’t let them sucker you into a late season bet. Justice Hill, RB, Oklahoma State: Hill has put together two very encouraging seasons in his first two years as a Cowboy. He averages 5.5 yards per carry and topped 200+ carries and 1,000+ yards in each season. In 2017 he increased his scoring production with 15 rushing TDs. He also got heavily involved in the passing game with 31 receptions and 190 receiving yards. He’s a bit undersized at 185lb but I would expect him to bulk up a bit after another offseason of training. Hill’s production was mostly overshadowed by the high powered passing offense led by former QB Mason Rudolph and WR James Washington. With that passing battery moving onto the NFL, Hill will see a larger share of the offense. David Sills, WR, West Virginia: David Sills, listed at 6030/201, is a quarterback-turned-receiver who led the nation in touchdown receptions in 2017. Sills only caught 60 balls for 980 yards, both just third best on the team. Sills has had an interesting path to being one of the conference’s top receiver prospects. You may recall that years ago then USC head coach Lane Kiffin offered a scholarship to a middle schooler. That player was Sills. He ultimately went to WVU instead where he was unable to earn playing time as a quarterback. He left the school to go the JUCO route before returning to the ‘Neers for a second stint, this time at WR. You could spin this as either a positive (he’s determined) or a negative (he must not be that good if it took so long to find the field as a receiver) so I’ll reserve judgment for now. 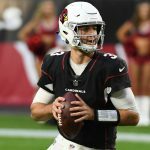 Sills has one of the leading quarterback prospects tossing him the ball so I anticipate another big season, although that touchdown rate will be impossible to keep up. 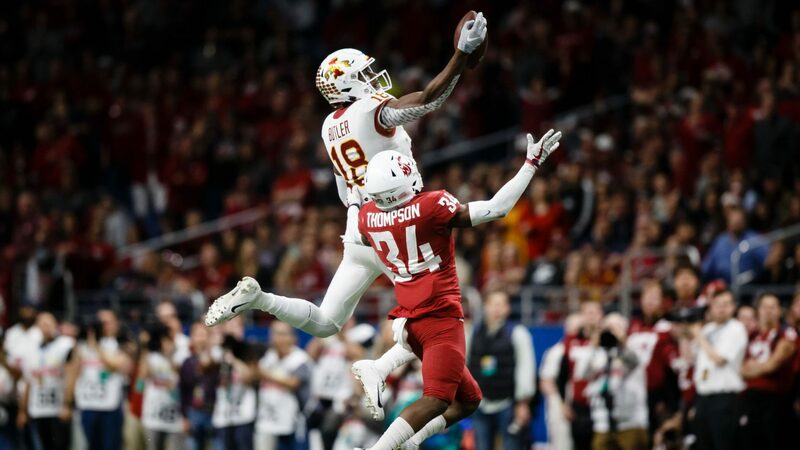 Collin Johnson, WR, Texas: If you’re looking for a high upside X receiver at the next level, look no further than Collin Johnson. He is massive at 6060/220 and would have been one of the biggest receivers in the 2017 class. The Longhorn offense struggled at times in 2017 while they switched between Shane Buechele and Sam Ehlinger. Neither signal caller was particularly great last year but Ehlinger offers some dynamism as a rusher so he’ll likely be the starter (he led the team with 381 rushing yards). At least whoever starts will boast some experience which should help Johnson improve on his 54-765-2 campaign. I want to see Johnson prove himself to be a red zone threat with that size so let’s hope the offense overall is improved. As the cliche goes, you can’t teach size. Denzel Mims, WR, Baylor: Mims had a few huge games last year for an atrocious Baylor team. Against Oklahoma, he went for 11-192-3. Meanwhile, against Texas Tech he had 12 grabs for 152 yards and a score. Unfortunately, both of those outings, plus two other 100+ yard games, weren’t enough to push the Bears past their opposition. Part of me worries that too much of his production may have come in garbage time (full disclosure: I haven’t studied the play-by-play to see when the bulk of his yards came, it’s just a thought I had while researching). His 6030/200 frame comes with 4.50 speed so if he can prove his value to the team we’ll be talking about him as an NFL Draft hopeful. Dalton Risner, OT, Kansas State: Risner measures in at 6050 and 300lbs and was a potential NFL Draft prospect in 2018 before deciding to return to to school. He had offseason shoulder surgery, surely one of the reasons he decided to return. Risner is a two-time First-Team All-Big 12 performer who has starting experience at both C and RT. That versatility will help increase his stock for the 2019 draft. 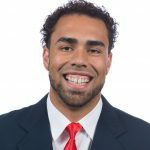 Dakota Allen, LB, Texas Tech: Allen is a leading IDP prospect but that’s probably not why you might recognize his name. In 2016, Allen transferred to East Mississippi Community College after being dismissed from Tech for burglary. EMCC is better known as “Last Chance U” and is the topic of a popular Netflix documentary series. Allen featured in the show’s second season. Tech’s coaches thought enough of the young man to give him another chance so here we are. Allen had 101 tackles in 2017 to go along with 2 sacks and 2 INTs. It’ll be interesting to hear what his narrative is, whether a story of redemption or of character concerns. For much of 2017, Will Grier was overshadowed by Baker Mayfield and Mason Rudolph in the Big 12 but that all changes this year when Grier figures to be the conference’s best. I briefly discussed Grier’s backstory last season so I won’t rehash it here and will instead focus on the stats and the tape. Grier completes nearly 65% of his passes and has a 3:1 TD:INT ratio for his career. 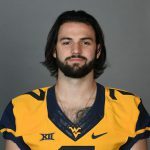 Last season with West Virginia, Grier finished in the top ten in the NCAA in passer rating (162.7), yards per attempt (9.0) and touchdowns (34). Those positive stats are backed up by some positive traits that I noticed while watching tape. When you watch Grier, it’s immediately clear that he has a confidence and a swagger that not all quarterbacks share. He trusts his arm and is not afraid to let it fly. He has one of the strongest arms of QBs I have watched so far this offseason. He can launch it 50 yards downfield on the run but can also quickly fire the ball to the sideline on a quick screen. That arm strength costs him some touch though, which was evident on a number of fade patterns near the end zone. As good as his arm strength is, Grier’s best attribute for me was his pocket presence. He does not get rattled as he slides and steps up. His feet are active while in the pocket which allows him to escape and evade with ease (his spin move reminded this Cowboy fan of one Tony Romo). All the while, he keeps his eyes downfield and scans through his progressions. I did note a few negatives in Grier’s game as well. His short yardage accuracy and mechanics can improve. He has a tendency to jump-pass short throws which often fell incomplete (or worse) in my study. Grier also had a few balls batted down at the line of scrimmage. The jump-pass tendency and the batted balls combine to lead me to believe he’s closer to 6000 than 6020 as listed. Grier shows the ability to anticipate receivers and lead them, especially on deep post routes where he’s adept at splitting the safeties, but that anticipation can be inconsistent. Grier is seemingly capable of the impossible, like his on-the-run hail mary touchdown against Kansas State, but he does have some work to do on the little things. He’ll be hoping to continue on the path to the NFL Draft that Mayfield and Rudolph walked last season. Grier is a top ten prospect at the position for me right now so I would anticipate him going sometime in Day Two come next April. David Montgomery was one of my favorite players to watch last season even though I wasn’t writing about him in a fantasy context since he was just a true sophomore. This year I’m excited to look at him through the fantasy lens. Montgomery’s highlight reel runs last season were abundant. According to Pro Football Focus, Montgomery broke their record for most missed tackles forced in a season, breaking Dalvin Cook’s record by more than 10%. Montgomery rushed for 1,148 yards and added 36 receptions for 296 yards. He had 11 rushing TDs which is good but not great, ranking 3rd in the conference. The biggest cause for concern is Montgomery’s yards per carry: 4.4. Of the fifty backs currently in my 2019 database, only two had averages lower than Montgomery and neither is remotely close to his quality. The low yards per carry average, in my opinion, is a result of Montgomery’s boom-or-bust tendency. I don’t actually track the stat but it felt like he had more no-gain runs than other running back prospects I studied this offseason. When Montgomery breaks loose though, he’s dangerous. He has fantastic change of direction, cutting ability and contact balance. It doesn’t matter where on his body he is contacted, he can usually keep his progress moving forward for extra yards. He repeatedly used a back cut at the line of scrimmage paired with enough acceleration to get around the whiffing defender. Montgomery is such a good pass blocker that I stopped taking notes on positive blocks. He’s also successful in the passing game, displaying good hands that he uses to snag the ball away from his body more often than not. Iowa State trusted his route running ability enough to have him running patterns from motion or lined up wide. When split out, he often runs a short stop route; out of the backfield he’s adept at finding space in the middle of the zone. On numerous occasions, Montgomery flashed a nifty spin move as he caught the ball on swing passes; it was super effective at making the first defender miss. He does lack elite speed but all of his other attributes help cover up the deficiency. Before I get into Anderson’s successes on the field last year, I first need to touch on the injuries that kept him off the field in 2015 and 2016. In 2015, Anderson suffered a broken leg in the second game of the season (he had just one carry before the injury). Before the 2016 season even started, he broke a bone in his neck which forced him to miss the entire season. At the time, coach Bob Stoops was quoted as saying, “there’s no paralysis or anything like that.” Hardly reassuring. Anderson also has a potential red flag in an alleged sexual assault from 2017. Ultimately the district attorney declined to press charges, saying that they were “unwarranted,” but I can’t help but think it will ding his NFL Draft stock. 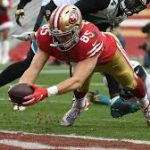 It’s a shame that his injury history may be disqualifying to many fantasy owners, myself included, because Anderson put out some great tape in 2017. The word I wrote most often when watching Anderson’s tape was “momentum.” He runs with great power and above average speed and often powers over and through defenders. While he may not have elite top speed, his acceleration appears to be elite after my limited watch of his film. Despite his 6020/220 size, Anderson is able to change direction and stop on a dime when necessary. On numerous occasions he was stopped cold in the backfield only to step back to find a small seam to gain some positive yardage. Anderson is a good pass blocker and I think with more experience could become one of the best at the position in next year’s draft class. My biggest gripe with his film against Georgia was his poor showing in the passing game. I am sure he has the talent, because he showed it in other games, but his routes rarely afforded him any space and his hands failed him on at least two plays against Georgia. Hopefully further film study will put that concern to rest. As my readers know, I am a Michigan homer but I’m going to be as impartial here as possible. There is no reason this game should be on New Year’s Day. I guess the NCAA (read as: ESPN) prefer to have some of the biggest games spaced out on Dec 29 and Dec 30 but it’s hard to get excited by this matchup. Both teams are 8-4 and were a combined 1-5 against ranked teams (notably that single win was Michigan over #17 Florida in the first game of the season before we knew how bad Florida was going to be). The teams are also banged up: per Sports-Reference.com’s injury reports, the teams have a combined 22 players injured with varying severity. Since Gamecocks WR Deebo Samuel has not returned to practice and will not play in the bowl, the most significant injury is likely to Michigan QB Brandon Peters. Peters started the year as the third stringer but was elevated to the starting role on Oct 28 against Rutgers. Wilton Speight got hurt in the team’s fourth game but wasn’t playing well anyway. Wolverines fans like myself got a taste of truly dreadful quarterback play when John O’Korn took over and struggled mightily. Peters has not been great (57.6% completion percentage, 4 TDs and 0 INTs) but he’s a significant improvement over the turnover prone O’Korn. The offense is led by a trio of running backs: Karan Higdon (929 yards, 11 TDs), Chris Evans (661-6) and Ty Isaac (548-2). Not surprisingly, none of the WRs are a factor. The team’s leading receiver is TE Sean McKeon (29-285-3). Keep an eye on FB Khalid Hill near the goal line. Hill only has 34 yards on 17 carries this season but he has three scores and had ten last year. Michigan’s defense is chock-full of NFL talent and they alone should warrant their own full-length piece. The biggest difference makers on that unit are DT Maurice Hurst and DE Rashan Gary. Hurst has 58 tackles, 13 tackles for loss and 5.5 sacks; Gary has 55-10.5-4. Gary is the better pro prospect, don’t be surprised if he’s a Top 3 pick in 2018, but the stats belie his skill because of how often he’s double teamed. This Youtube video is a good cut-up of 2016 highlights for a number of 2017’s key defensive players, including LBs Chase Winovich and Mike McCray. It’s a shame Deebo Samuel won’t be back for the bowl after a broken leg. Reports earlier in the season were that he could return but he has not practiced. Samuel is draft eligible but he should probably return for another year. He has fifteen career touchdowns (7 rushing, 5 receiving, 3 returning) and is an explosive game breaker. Sophomore QB Jake Bentley regressed in 2017 in terms of his rate stats and efficiency. I have not watched much of Bentley so I’m not able to provide much analysis here but I’ll bet that there’s a good chance he doesn’t start 2018 as the starter. TE Hayden Hurst is the team’s best NFL prospect. He had 41 receptions for 518 yards and 2 TDs this year. He has not been a high volume scorer (just 3 career TDs) but he is a good pass catcher and at least an average blocker in my film study. Hurst was my TE2 when I did 2018 rookie positional rankings in November; he’ll probably come in a little lower than that but he’s still a possible rookie pick in many fantasy leagues. LB Skai Moore is a four year contributor who has 346 career tackles, 5 career sacks and 14 career interceptions. Moore is WalterFootball.com’s 12th ranked OLB. His versatility in pass coverage should earn him a Day Two draft pick. What a game this one is going to be. We all know the story surrounding outgoing UCF head coach Scott Frost so let’s not beat the proverbial dead horse because the spotlight should be on the players. Auburn had a roller coaster of a season. Heading into SEC play they were 2-1 but with two poor wins and a close loss to #3 Clemson. They made it up to #10 but a loss to LSU bumped them all the way down to #21. From there they worked their way into the playoff picture with wins over #2 Georgia and #1 Alabama (both of whom are playing in the playoff despite their losses to Auburn). A poor showing in the rematch against Georgia sealed their outside-looking-in fate. Throughout the season they were led by two players on offense: QB Jarrett Stidham and RB Kerryon Johnson. I was lukewarm regarding Stidham for most of the year but he won me over against Alabama. I wrote him up that week and compared him favorably to Alex Smith. He’s an efficient and athletic game manager which sounds like an insult but it’s actually high praise (don’t forget that Smith was taken first overall in 2005). Stidham threw just one INT in SEC play but has a mixed bag of results in the year’s biggest games (good games against Georgia and Alabama, bad games against Georgia and Clemson). UCF has a poor passing defense so I expect Stidham to put up big numbers. Kerryon Johnson has battled some injuries this season but he was still very productive in eleven games (1,320 rushing yards, 23 rushing TDs, 23 receptions, 188 receiving yards, 2 receiving TDs). I did not rank Johnson in my Top 15 for 2018 rookie RBs but his success in November has me re-thinking that: over 700 totals yards and 15 total TDs. As far as non-offensive skill positions go, the Tigers have three NFL talents. At corner, Carlton Davis could land near the end of the first round. According to Pro Football Focus, Davis was the 50th ranked player in “Cover Snaps per Reception” and was average in passer rating against. 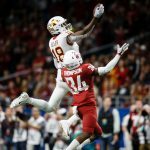 Still, my preferred draft sources (WalterFootball.com and NFLDraftScout.com) favor him over guys I like more like Josh Jackson or Jaire Alexander. OG Braden Smith will be a second tier option for teams who miss on the elite prospects in a guard-heavy draft. K Daniel Carlson will end up getting drafted before the 6th round by some team desperate to end their kicking woes; he has played in 52 career games and hit on 90 of his 111 attempts (plus a perfect 195-195 record on PATs). In a game destined to come down to who has the ball last, Carlson could be a factor. The UCF offense is all about QB McKenzie Milton. I have been praising him for a few weeks now because he is one of the purest passers I remember watching in recent memory. His deep ball looks effortless and he’s not afraid to throw it – he can just spin it. Milton played as a freshman in 2016 but exploded in 2017. He threw for 3,795 yards and 35 TDs and completed 69.2% of his passes. The biggest knock on Milton is his size. He’s listed at 5’11” and 177lbs and that might be soaking wet with two sets of shoulder pads on. I don’t think there is any way we talk about Milton as a pro prospect next year so enjoy him now as a fun to watch college QB. WR Tre’Quan Smith is the biggest benefactor of Milton’s prolific passing. He only caught 54 balls but went for 1,082 yards (an outstanding 20.0 yards per reception) and 13 TDs. 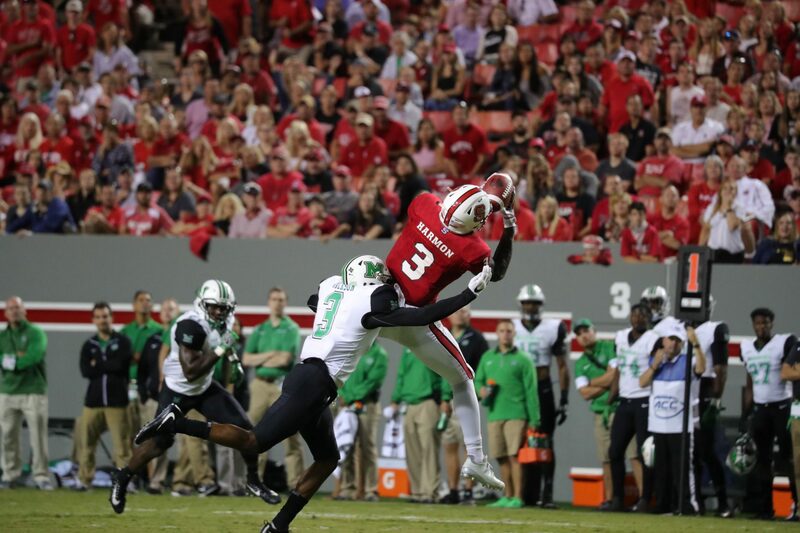 Per PFF, Smith is fourth in the FBS in “Deep Receiving Catch Rate” by catching 68.4% of his deep attempts. Smith has 50+ receptions in each of his three seasons so who knows maybe another solid 2018 gets him drafted. UCF does not have any high level NFL hopefuls but you should read up on LB Shaquem Griffin. He was the conference’s Defensive Player of the Year in 2016 after finishing with 92 tackles, 20 tackles for loss and 11.5 sacks. His stats all decreased this year but that doesn’t make him any less fun to watch. Griffin’s left hand was amputated in 1999 and against all odds he is pushing for a shot in the NFL. I envy people like Griffin who can overcome their physical limitations to do great things, I’m not sure I would have the strength to do so myself, and I don’t doubt for a second that he’ll make an impression on NFL scouts. LSU has earned some headlines over the last 24 hours as reports have come out that offensive coordinator Matt Canada is leaving the team. Canada’s offense is famous for its pre-snap shifts and movement. Ironically, Canada’s career is famous for its movement too because he can’t stick around anywhere too long (six different schools since 2010); maybe the gimmick just isn’t worth all of the effort and time it must take to learn. Notre Dame coach Brian Kelly is always surrounded by rumors too because half the fan base hates him. LSU was an enigma to me this season. Midway through the year, I was honestly surprised to see that 5-2 LSU was ranked #24. One of those losses was to Troy from the Sun Belt which would seem to be disqualifying. Of the other Power 5 teams in the Top 25, only Stanford (vs San Diego State) has a loss to a Group of 5 team; and that is without a doubt a stronger loss than LSU’s. I guess the committee felt that LSU’s win over then #10 Auburn more than made up for the bad loss (but by that logic Ohio State should have been in over Alabama). LSU has two players who will go at the top of drafts: DE Arden Key in the NFL Draft and RB Derrius Guice in your rookie draft. Guice has been as under the radar as the soon to be 1.02 can. Saquon Barkley has, deservedly, received a ton of attention this season but second tier backs like Ronald Jones and Bryce Love have stolen some of the shine that should be on Guice. He has confirmed that he will play in the Citrus Bowl which is good because I figured he might follow former teammate Leonard Fournette’s lead and skip the bowl. Guice had a solid season but was not as dominant as he was last year when sharing the backfield with Fournette. This year Guice finished with a 1,153-11 line. He’s not a big receiving threat (just 29 career receptions, 15 of which came this year) which could limit his utility at the start of his NFL career. It turns out that my feelings about Guice from August were spot-on: “I’m very interested to see how Guice does without Fournette…in 2017. If he can repeat even 75% of his production from 2016 he’ll be a first round NFL back. What I saw in Guice’s tape was not enough for me to push him to RB1 over Penn State’s Saquon Barkley, but at worst, Guice will be your 1.02 for 2018.” Injuries derailed Arden Key’s season and will cause him to miss the bowl. He still has an elite size and speed combination plus enough production to guarantee he finds the Top 10 in the NFL Draft. WR DJ Chark had 47 touches for 874 total yards and 4 TDs; his production is undraftable but his 6’4″ height could get him a look. CB Donte Jackson is WalterFootball.com’s 3rd ranked corner. The strength of Notre Dame’s team, stop me if you’ve heard this before, is their offensive line. I would not at all be surprised for Notre Dame to have both the first tackle and the first guard drafted, both likely in the Top 15. T Mike McGlinchey (6’8″ and 315lbs) and G Quentin Nelson (6’5″ and 330lbs) were both first team All-Americans. They pave the way for RB Josh Adams and QB Brandon Wimbush to rack up rushing yards. Adams finished with 1,386 yards and 9 TDs while Wimbush had 766 and 14. I am not a fan of Wimbush because he is such an inaccurate passer but you can’t deny his ability as a runner. I have waffled on Adams throughout the season but I remain concerned about his size at the next level (he’s too tall – click the link for my analysis). In Week 9, I predicted he’d be a 3rd round rookie draft pick and I’ll stand by that now. It’s a shame that Wimbush has struggled to complete passes because WR Equanimeious St. Brown (my vote for the first player to break RSO’s draft software because of the length of this name) has such potential. St. Brown is long and lean (he really needs to add about 10lbs to make it in the NFL) with a good pedigree (4 star recruit, offers from a number of big schools). If he comes out he is going to have to dominate the combine because his production is below average (90-1,437-13 in two seasons as a starter). LB Nyles Morgan considered coming out after his junior year (88 tackles, 6 tackles for loss, 4 sacks) but returned to school; unfortunately for Morgan, 2017 probably hurt his stock more than helped it (82-6.5-1). Both WalterFootball.com and NFLDraftScout.com have him as either a 7th rounder or undrafted. And here we are, finally the College Football Playoff, 39 games later. 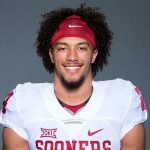 The Georgia vs Oklahoma matchup may lack the familiarity of the Alabama vs Clemson matchup but it will be equally entertaining featuring a great matchup of Oklahoma’s offense against Georgia’s defense. Baker Mayfield is apparently sick but there’s no way that it keeps him off the field. Oklahoma’s season was momentarily disrupted by their Oct 7 loss to Iowa State but they went on to win eight straight including three wins against teams ranked #8, #10 and #11. Coming into the season, I had serious doubts about whether Baker Mayfield was going to 1) win the Heisman and 2) become a top NFL prospect. Turns out that I was wrong on both accounts. Mayfield has been exceptional this season. Who would have thought it would be possible to improve on his 2016 numbers, but he did. 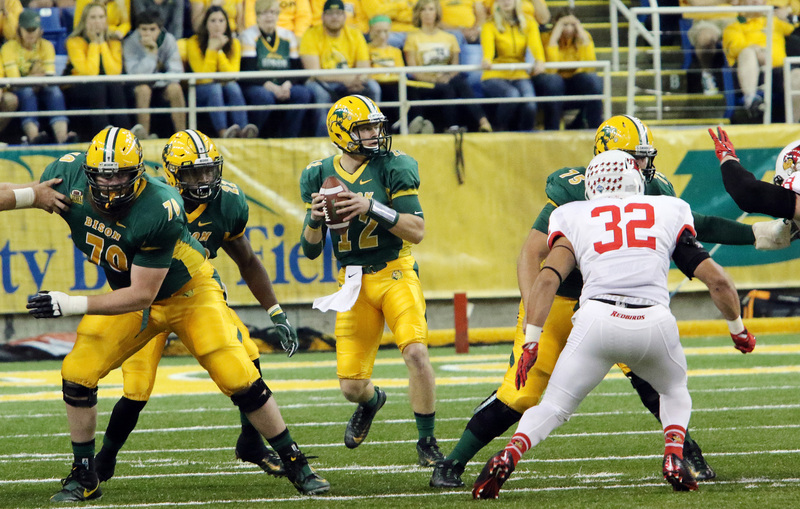 Mayfield finished with 4,340 yards (2nd in FBS), 41 passing TDs (2nd) and completed 71.0% of his passes (1st). His interceptions went down, his yards per attempt went up, and on and on. There just aren’t enough superlatives for what Mayfield accomplished on the field this season, especially considering that he is a former walk-on at Texas Tech. Mayfield does have some “character” question marks but I don’t think any of them are enough to ding his draft stock. I had Mayfield as my QB6 when I ranked potential 2018 rookies but I think he’ll likely be in the QB4 range by moving ahead of Luke Falk and Lamar Jackson. I expect Mayfield to be drafted in the first half of the first round in April; depending on his landing spot he could be a factor in fantasy leagues as a rookie. Mayfield is surrounded by a strong supporting cast composed mostly of underclassmen. That includes sophomore RB Rodney Anderson (960 yards, 11 TDs), freshman RB Trey Sermon (710-5) and freshman WR CeeDee Lamb (40 receptions, 741 yards, 7 TDs). Aside from Mayfield, the best pro prospect is TE Mark Andrews. Andrews is 6’5″ and 254lbs and often plays in the slot to maximize his size advantage over smaller corners and safeties. Andrews is certainly not the most well-rounded TE in the class but he will likely be the first drafted in 2018 rookie drafts for his receiving ability. In my early 2018 mock rookie draft I had Andrews as the 2.10 pick and the first TE off the board. Andrews led the team in receptions (58) and receiving TDs (8) and was second in receiving yards (906). LT Orlando Brown seems to be a polarizing player in mock drafts as I have seen him as high as the 2nd overall pick to the 18th overall pick to all the way down to 59th overall. The Sooners defense is led by DE Ogbonnia Okoronkwo. Okoronkwo has two straight 70+ tackle and 8+ sack seasons. He landed on numerous second team All-American lists and was the Big 12’s Defensive Player of the Year (shared with Malik Jefferson). Georgia had some quarterback controversy very early in the year when freshman Jake Fromm took over for the injured Jacob Eason in the season opener. Regardless of how well Eason played in 2016 as a freshman, there was no way he was getting the job back from Fromm once he took over. By virtue of their strong rushing game, Fromm is not counted on to throw the ball much (he had six games with fewer than ten completions) but when he does he is efficient. He ended the season with 21 TDs and 5 INTs and had rate stats significantly higher than those of Eason in 2016. The run game is a three-headed monster featuring Nick Chubb, Sony Michel and D’Andre Swift. Chubb led the way with 1,175 yards and 13 TDs; Michel had 948 yards and 13 TDs; Swift had 597 yards and 3 TDs. Neither Chubb nor Michel are pass catchers but Swift did have 15 receptions. Swift is a true freshman and a name to watch for next season after Chubb and Michel leave for the NFL. Both Chubb and Michel were drafted in my 2018 early mock draft (Chubb at 1.03, Michel at 2.06). Chubb has an injury history which may trouble some NFL teams but he’s been mostly healthy since his 2015 knee injury. Swift closed out the SEC Championship game against Auburn and had 94 total yards on 10 touches – look for a similar output here in the bowl because Georgia will need to get the ball out quick to neutralize the pass rush. The Georgia defense is led by two LBs who are bound to be IDP considerations in 2018. The lesser prospect is DE/OLB rusher Lorenzo Carter. Carter had 48 tackles, 8 tackles for loss, 4 sacks, 3 forced fumbles and 3 fumble recoveries this season. I researched him back in Week 4 and guessed he could end up as a first rounder – that may be a little high but he could still get picked on Day Two. Roquan Smith is an elite prospect. He was named SEC Defensive Player of the Year and is a first team All-American. In 2016 he had 95 tackles with no sacks, this year he improved to 113 tackles and 5 sacks. He’s the top draft eligible player at the position and will be a Top 10 draft pick. How often is the third installment of a trilogy the best? Probably never unless you’re a big Return of the Jedi fan. I don’t think this one will have the juice of the last two matchups because we’re missing the star that is Deshaun Watson. Don’t get me wrong it’ll be entertaining but we won’t be seeing this one on ESPN Classic in ten years. Alabama snuck into the playoff in my opinion. If it were up to me, I would have taken Ohio State because they won their conference and did not have any FCS wins. Sure, Alabama has one less loss but in my mind they also have two less wins. Alabama is full of familiar names so we’ll go through them quickly. QB Jalen Hurts feels like he’s been around for half a decade but he’s just a sophomore. He is a run-first quarterback (he led the team in rush attempts with 137) who really improved as a passer this year. His yards per attempt went up to 9.0 from 7.3 and he threw just one INT (he also only lost one fumble). He didn’t run as much in 2017 as he did in 2016 but he also increased his yards per rush this year. Nick Saban trusts him with the ball in his hands and you can see why. In the preseason, my preferred Crimson Tide RB was Bo Scarborough; he disappointed this year with just 549 yards and 8 TDs. I will be lowering him in my 2018 rookie rankings (assuming he comes out). The best back this year was Damien Harris who is also draft eligible; he leapfrogged Scarborough in my early 2018 positional rankings. 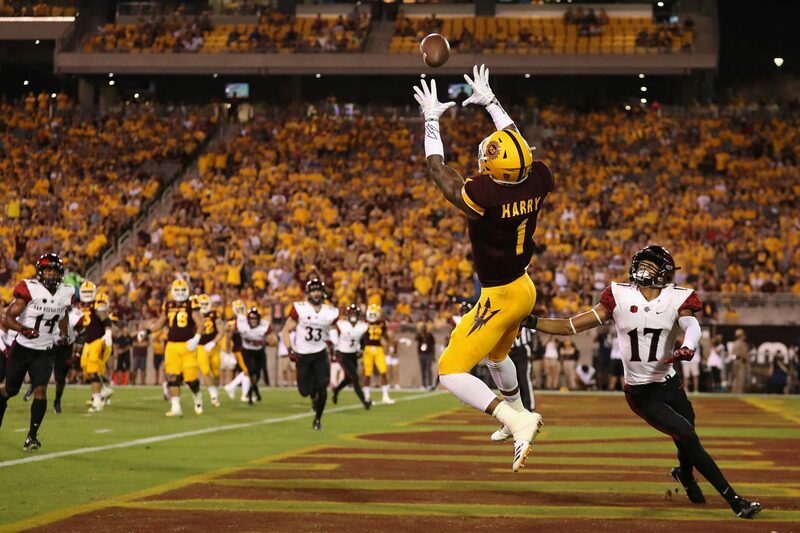 Harris ran for 906 yards and 11 TDs but added just 8 receptions. He’ll probably be an early 2nd round rookie pick for me next year. WR Calvin Ridley is still my WR1 despite the fact that many draft analysts disagree with me. Ridley’s production has been hampered by a run-heavy offense so of course we aren’t going to see production like Amari Cooper or Julio Jones. Ridley is a little too light so I would like to see him add about 10lbs in the offseason to approximate Cooper’s size. 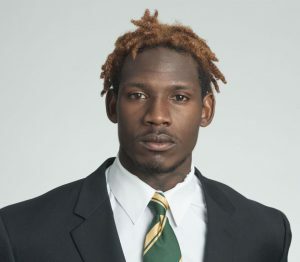 Ridley has a pedigree that few prospects can match: he was ESPN’s #1 recruit in his class and was the leading receiver for Alabama in three straight seasons in which they contended for the national championship. I’m not scared off by his decreasing production and will keep him as my WR1 until he proves me otherwise. Alabama has a number of defensive prospects including LB Rashaan Evans, S Ronnie Harrison and DT Da’Shawn Hand but the number one guy is DB Minkah Fitzpatrick. Fitzpatrick has played both corner and safety so he offers versatility in both pass coverage and run support. His stats decreased from 2016 (66 tackles vs 55, 6 INTs vs 1) but he was battling a hamstring injury so that could have been the cause. He has four career interception return touchdowns so when he has the ball in his hands he can change a game too. Fitzpatrick is likely to go in the Top 3 in the NFL Draft and will instantly makeover a struggling defense. I put out my first playoff ranking in Week 7 and had Clemson as the #1 team (I also had Alabama and Georgia, three out of four ain’t bad) and am happy to see them ascend back to the #1 spot after that loss to Syracuse. Like Alabama, the strength of the team lies on defense. There might be fix or six guys from the defense drafted this Spring. DT Christian Wilkins started the season with some preseason hype, played well and increased his stats in 2017 (52 tackles, 5.0 sacks). 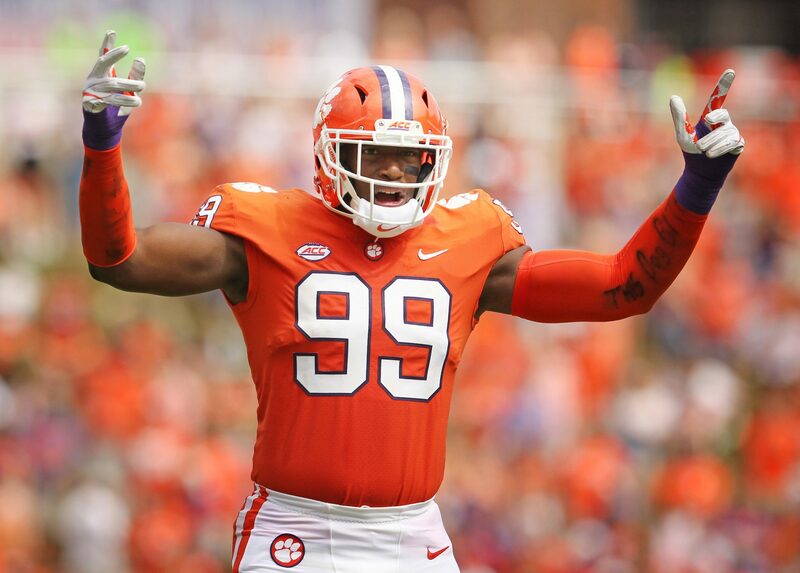 Wilkins will be a first rounder but challenging him to be the first pick from Clemson will be DE Clelin Ferrell. Ferrell is just a redshirt sophomore but he broke out in 2017 for 62 tackles, 17 tackles for loss and 8.5 sacks. The defense also has two tackle machines in Kendall Joseph and Dorian O’Daniel. The Clemson offense is similar to that of Alabama in that it features an efficient rush-first quarterback. That quarterback is Kelly Bryant. Bryant managed to play in each game despite an ankle injury and a concussion (he left that loss to Syracuse early due to the concussion). Bryant only threw for 13 TDs but rushed for 11 more. Freshman RB Travis Etienne is a burner who came on early in the season with some big plays to close out blowout wins. He finished strong too: he had six scores over the last four games. Etienne only had double digit carries twice so he’s not a high volume player but his speed means he’s only one missed tackle away from a touchdown. WR Deon Cain (55-659-6) is a top receiver prospect for many analysts but I’m not sold. He does not have elite size or production; I’ll wait and see how he does at the combine but I’m not sure his speed will make up for the other aspects. Cain was suspended for the semi-final and championship games in 2015 after a failed drug test which will factor into his draft evaluation too. WRs Hunter Renfrow and Ray-Ray McCloud are undersized but trustworthy possession receivers.